Source of title proper: Title based on the creator of the records. Canadian National Railway (CN) was incorporated as a Crown corporation on the 6th of June 1919. It is the longest railway system and the only transcontinental railway in North America. Canadian National originated from five railways: the Grand Trunk Railway, the Intercolonial Railway, the Canadian Northern Railway, the National Trans Continental Railway, and the Grand Trunk Pacific Railway (1917-1923). The conglomeration came about after a Royal Commission was called in 1917, which recommended the nationalization of all the railways except the Canadian Pacific Railway. During the depression of the 1930s there was a loss in traffic volume partially due to highway and air traffic increases, which led to a decrease in wages and employment. From the 1950s to 1960s, Canadian National began to modernize and converted to diesel locomotives and electronic signaling. The head office was also moved to Montréal. By 1989 Canadian National divested its non-rail business and abandoned thousands of kilometers of track, networks, and branch lines across the country to become a primarily freight rail company. In 1995 Canadian National was privatized and many of its shares purchased by American investors; however, the headquarters remained in Montréal to ensure that Canadian National remained a Canadian corporation. 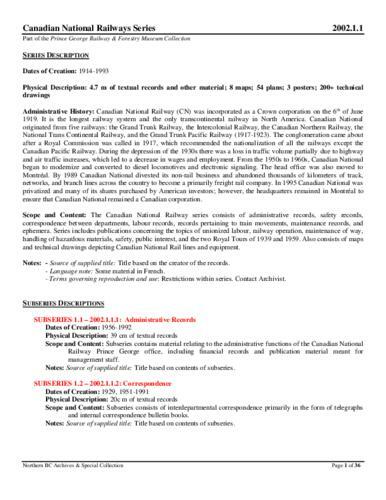 The Canadian National Railway series consists of administrative records, safety records, correspondence between departments, labour records, records pertaining to train movements, maintenance records, and ephemera. Includes publications concerning the topics of unionized labour, railway operation, maintenance of way, handling of hazardous materials, safety, public interest, and the two Royal Tours of 1939 and 1959. Also consists of maps and technical drawings depicting Canadian National Rail lines and equipment. See attached .pdf File List.